While posting Java sources on this blog, I used to wish that the browsers could take care of chroma-coding Java sources just the way they take care of chroma-coding XML files. It would eliminate the hassle of exporting the sources in HTML format. All one would have to do is paste the Java source in a pre block and viola! you are done with it! 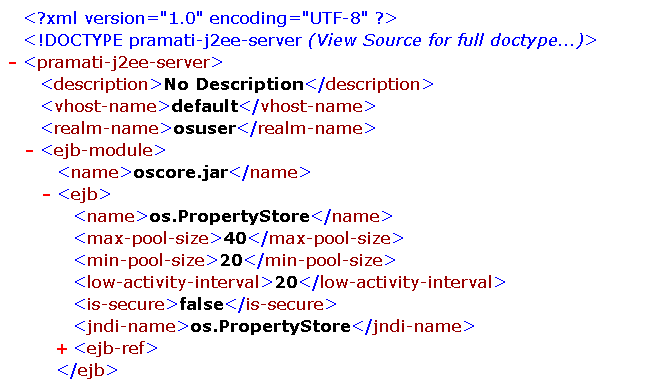 Below is the HTML colorized version of ClassParser.java from the BCEL sources. Check out the curly braces … they are live! Clicking on them will show or hide the enclosed block! Now for the surprise … if you look at the HTML source for the above part, you will see only plain java source. All the colorization and parenthesis matching has been done in jscc.js, jsccJAVA.js and jscc.css referred to in the head of the HTML file. Pretty neat huh?! * further details about the structure of a bytecode file. * Parse class from the given stream. /*** Parse class from given .class file. * the contained data, i.e., constants, methods, fields and commands. * is performed by the java interpreter). * Read information about the attributes of the class. * Read information about the class and its super class. * according to the JVM specification. * Read constant pool entries. * Read information about the fields of the class, i.e., its variables. * Check whether the header of the file is ok.
* Of course, this has to be the first action on successive file reads. * Read information about the interfaces implemented by this class. * Read information about the methods of the class. * Read major and minor version of compiler which created the file. a regular expression which matched both! only on FireFox[0.8+] and IE [5.5+]. The joy of separating style from content! I have always had this fascination for CSS. Moving from hard-coding-style-in-HTML-sources to defining-it-in-CSS is like moving from Procedural Programming to Object Oriented Programming. Defining style classes gives a very consistent feel to the whole site [assuming you have defined your style classes properly!] And if you want to change how some of the content looks, all you need to touch is the CSS file. You no longer have to depend on complex search and replace regular expressions. So, when I wrote the Export to HTML plug-in for Pramati Studio, I made sure the exported HTMLs used common CSS files to set colors and fonts. Changing the colors and fonts in one CSS, changes the appearance of all the sources. Wanna checkout the layout capabilities of CSS?! How about moving the main content to the right?! Or how about choosing a more tacky theme?! If you are a firefox user, you can choose an alternate style sheet using it’s style sheet switcher. What’s more, firefox will remember your choice the next time you visit this page! Apart from the advantages you get from abstracting style into classes, better accessibility is another key benefit of using CSS. The other day I was reading this very neat book on accessibility, called Dive Into Accessibility. I loved the way the content is presented in the context of some "real people" and how they benefit from sites using CSS. In the chapter Presenting your main content first , Mark points out that screen readers read aloud the content of the HTML source from top to bottom. However, most sites have the navigation links at the top of the HTML source followed by the main content. So a screen reader has to read out all the navigation links before reaching the main content. What a pain! One of the advantages of using CSS is the ability to control the layout of HTML elements independent of their location in the HTML source. So, using CSS we could have the main content of the page at the TOP of the HTML source though it is visually layed out at the center of the page. It hardly takes any time to read and appreciate the book … but trust me, it takes a whole lot longer to implement it and to get it into your blood! … but then I have made a start! Check out how this page would look to a screen reader or in a text browser [needs to be improved].